Hannah began her piano studies at the age of 5 with Dallas teacher Jennifer Harrison Powell. While studying with Mrs. Powell, Hannah received numerous awards in competitions across the state and participated in master classes with pianists including Van Cliburn winner Jose Feghali, Ronald Rathbun, Pauline Bjorem, Carol Leone, Sam Holland, and Mark Puckett. 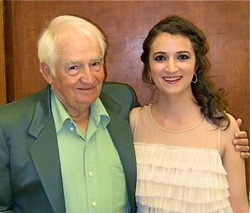 After graduating from Lake Highlands High School, Hannah began studying piano at Southern Methodist University with acclaimed pianist and teacher Alfred Mouledous. For two consecutive years Hannah was presented with the Paul van Katwijk award as the outstanding undergraduate pianist. While at SMU she has accompanied many groups and individuals. Hannah has participated in master classes with Carol Leone, Pamela Mia Paul, Joaquin Achucarro, Jerome Rose, and Warren Jones. She has taught pre-college students in the SMU Piano Preparatory Department, where she was one of the first undergraduates to be asked to do so. In the SMU Piano Preparatory program, Hannah has received one-on-one and group training with the leading piano pedagogues in the country, studying how to teach piano specifically to pre-college students. In 2010 Hannah graduated with a Bachelor of Music in Piano Performance. In 2011 Hannah returned to SMU with a Meadows Artistic Scholarship to continue her studies in piano performance and pedagogy. Teaching responsibilities included undergraduate class piano classes for music majors and non-majors. She also taught weekly private lessons and group lessons for students in the Piano Preparatory Department. Hannah continued her performance studies with Alfred Mouledous and pedagogy studies with Cathy Lysinger and Sam Holland. She graduated with a Master of Music in Piano Performance and Pedagogy in May 2013. Hannah is a staff accompanist at SMU and is the staff accompanist for Lake Highlands United Methodist Church. She frequently performs around the area.